In simple terms, a landing page is just what it sounds like: the page someone lands on when they click through a link. And for authors, that is most often the Amazon.com listing of a book. It’s the place where we send our traffic from our social media links, web site links and most paid advertising. And as such, it’s the most important part in turning a browser into a buyer. In many digital marketing instances, the marketer has full control over the layout design of this page, and can build out an experience fully-optimized toward driving a conversion (which in this example, is a sale – though it could also be something such as signing up for a newsletter, or building business leads). For authors who are selling through major retailers, such as Amazon, it is not quite as simple. We cannot modify the entire layout of an Amazon product listing page … but what we can do is maximize the impact of each individual aspect we do have control of. And this is where optimizing your book listing comes into play. The first step in doing this is knowing just what elements of the page we do have control over, and there are quite a few of them. Building out an effective landing page / high converting “Amazon listing” requires not only an understanding of each of these, but how to optimize them individually as well as how they work together. The first time anyone comes across your book, they’re likely to see two pieces of information: the book title and the book’s cover. A lot of the success of if people even visit your book listing is dependent upon these factors as well, but here we will focus particularly on how they can affect actual sell-through once someone does get to your page. As stated earlier, first impressions are one of the most important aspects in driving any interest in an unknown product. Anything you can do to reinforce the “brand” of the product (i.e. what type of story this is) will only help benefit your overall sell-through. For example: If you’re a company selling a new type of sugar substitute, you’d see better results highlighting images of sweet things like pies or teas on your packaging than you would with a photograph of a hamburger. Your cover art is your packaging, and it must match the product that lies within. There are subtle and overt ways to do this. For example, if you are writing a classic fantasy story with wizards and sword fights, you can make it obvious what type of book you’re offering by including images of wizards and sword fights on the cover. Your typeface for the title should match the feel as well. A typewriter styled font doesn’t imbue the same feeling of fantasy as one with great swoops and curves, like you’d find on the cover of one of Tolkien’s Lord of the Rings books. But matching your cover design exactly to the tropes and (often tired imagery) associated with a genre doesn’t always mean beating your reader over the head with it. What it does mean though is that whatever you are showing your potential reader should give them some sort of idea of what to expect if they were to pick up that book from a bookshelf. Or at least get them to want to go further into the book listing, and find out more about the book. Most importantly, your cover’s aesthetic is a first impression in itself. While the individual aspects of the design, such as imagery, color palette and typography should all be considered, ABOVE ALL, make sure your cover art looks good. As the indicator of what lies inside, poorly designed covers can immediately turn your potential reader away as they will think that if the cover looks like it was done by an amateur, what’s inside likely was as well. For this reason, unless you possess strong graphic design skills, I strongly recommend working with an experienced cover designer. A TIP WHEN DESIGNING YOUR COVER, especially if you are planning on doing most of your sales online through sites like Amazon: Make sure your title, author and any other important information meant to be seen is easily readable in the shrunken down “thumbnail” size image. What looks good on a nice 6×9 printed cover does not necessarily look good shrunken down on Amazon’s search or product display listings. Large type and color schemes using complementary colors can do quite a bit to make your book “pop” and make digestion of key information much simpler for potential readers who may do no more than give your page a quick glance before deciding to stay and learn more, or click the back button and exit your page. You can “hack” your title. A good title for your book can matter considerably in sell-through. There’s an entire art to titling books, and it can vary between fiction and nonfiction. But what’s most important in your title, as it comes to the Amazon listing, is if there is any way you can reemphasize what kind of book you are offering. One way many authors do this is by using the “Subtitle” field when creating their book data in Kindle Publishing (or wherever you publish). 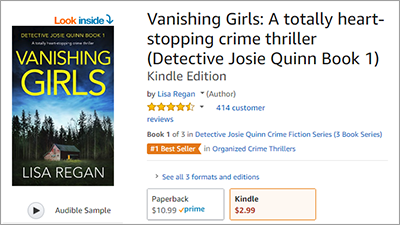 Take, for, example, what indie author Lisa Regan has done with the title of her book, Vanishing Girls. It’s a fairly strong title, and combined with its cover featuring a creepy cabin out in the middle of nowhere, gets across the general concept that this book could be a thriller or mystery. But what she’s done to take things one step further is to explicitly state what kind of book it is through the use of the subtitle. As you can see, she has written in a catchy micro-description of the book, directly into the title, by doing so. Instead of just Vanishing Girls, the book is now titled Vanishing Girls: A totally heart-stopping crime thriller. Gets across the genre quite a bit more effectively, right? One thing to note, however, is that Amazon can be subjective in their approval of changes like this, as it can be considered spammy. But one way to get around this that follows Amazon’s policies and is actually complementary to your book design is to include the subtitle directly on the cover of the book itself. As a general rule, if the text exists as a subtitle on the book cover art it can be included within the actual subtitle as well. By no means is a hack like this necessary, but it can be effective. Personally I prefer to keep my titles clean, and only include a subtitle if the book really calls for one. But this is a personal preference, and simply one where you as the author must make a decision in how you want to present your book to potential readers. One of many instances where the battle of form vs. function will come into play when producing and marketing your book. This is the part where you really get the chance to sell your book. It’s referred to by multiple different names, most often as the “blurb” or “product description.” And it’s often the one people fear writing and struggle with the most, but can also have the most impact on if a reader decides to take the plunge and buy your book. At its most basic, the product description is the place where you write out a description for what the book is. Why a reader might like it. Why they should buy it. There’s an entire art to this, and multiple ways to approach it (in fact, there are entire books available about the topic, such as Dean Wesley Smith’s How to Write Fiction Sales Copy). Writing this requires an entirely different set of skills than writing your actual book, a set of skills commonly referred to as “copywriting.” Which is basically writing copy that drives people to take action, tying into psychological triggers that can be persuasive in driving customers to take action. (Ray Edwards’ How to Write Copy that Sells is a good book on the basic concept). But for a quick crash-course in copywriting blurbs for your selling your book, including some basic techniques that have worked for me, read on. One thing to get straight right off the bat is that your back cover blurb and your product description are not the same thing. The blurb on the back of your book serves a different purpose than your product description. 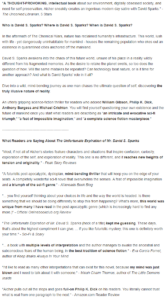 Specifically, that back cover blurb primarily exists to help potential readers shopping in a traditional book store, get a better idea of what the book is about. In traditional bookstores, your cover can grab attention, and your back cover blurb can give a kind of synopsis / teaser of the story. Something the whet the readers’ appetite. On your Amazon page, you’re looking to do quite a bit more than just explain what the book is about. What you want to do is hook the reader as quickly as possible, then get into the description of the book. 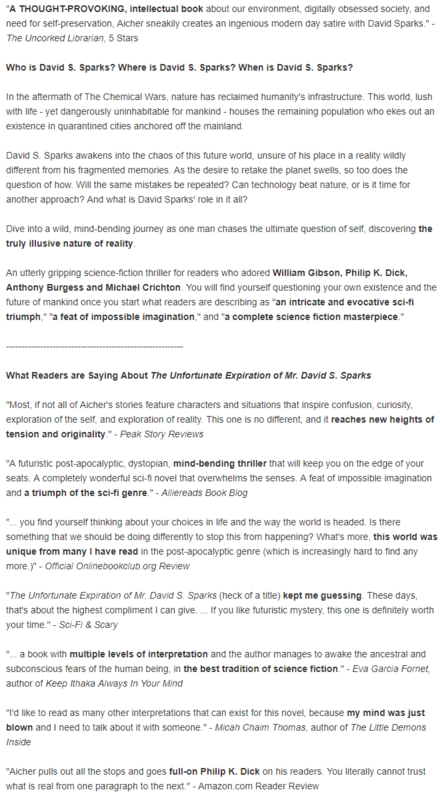 When a potential reader visits your book listing page, they will be presented with only a small snippet from the overall description. This means you have to grab the reader quickly, and have that small snippet of text either drive the customer to purchase immediately, or click the “more” link to expand out the product description so they can continue exploring what you have to offer. Think about what you want the reader to see first. What will grab their attention? In my experience, a small quote from a review does the trick nicely – especially if that snippet includes trigger keywords that can help give the reader a sense of what kind of book it is and why it’s SO AMAZING. If your book has won awards, this can be a great place to highlight them as well – especially if they can contain a quote about the book that works as a testimonial. And if you’re book is brand new, and you don’t have any reviews or awards or anything else to highlight? Start with a question. Or something with high stakes. Your goal here is to hook the reader and draw them in to continue along the path of deciding if this is a book they would like to read. 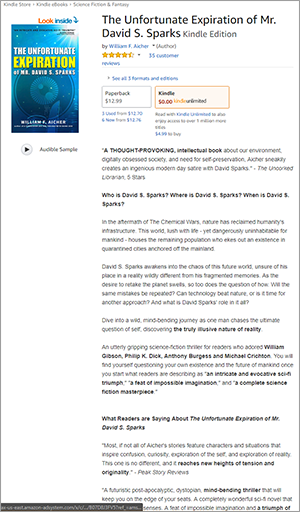 As mentioned previously, Amazon only displays a portion of your full description when visitors land on your book listing page. The rest is hidden behind what is often referred to as “the break.” That’s the part where the text continues, but the customer has to take an action (usually a click) to expand the text to continue reading. You’ll want to make sure your most important information – in particular your “hook” is short enough to be fully contained in the space before the break. But you should also be mindful of the space between your hook and the break. This is your opportunity to encourage the reader to keep reading, by ensuring that some copy of your description displays before the break. Think of it as a sentence or paragraph that has a start, but doesn’t has an end … and as the potential customer is reading the description, they can’t help but want to click to expand and read more. 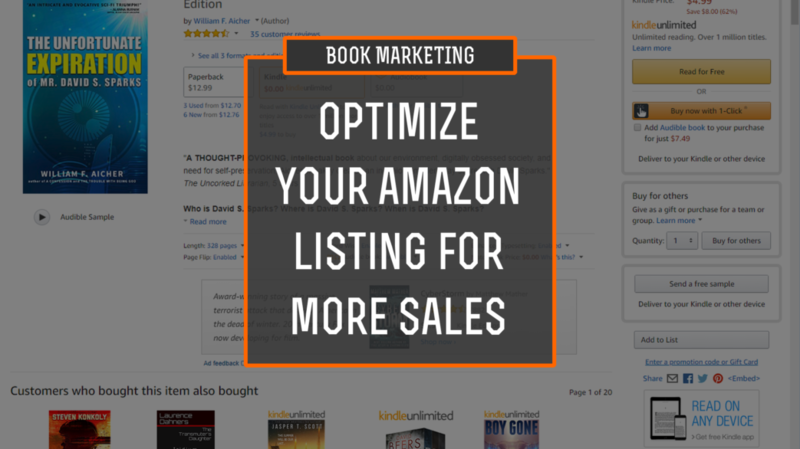 This way you can further engage them in the browsing experience on your book listing page and start getting into the meat of your sales pitch. Readers do generally want to know what a book is about before they buy it. So you can’t just have a product description that’s a big pitch of sales copy. After all, they are looking for something to read – and reading takes an investment of time. Not to mention, there are plenty of other books out there that you are competing with. So you absolutely should include a general description of what the book is about, and this is a good opportunity to repurpose your back cover blurb. But there are several important things to keep in mind when describing the book – and multiple different approaches you can take to writing this. Most important, however, is that you don’t turn this section into a full synopsis of the story. It’s a teaser. A taste of what the reader will find inside. You don’t want to give away any spoilers, but you also need to be wary of turning it into a “Cliffs Notes” version of the story. Other than your hook and book description / sales pitch, one other piece of information you can include in your description are reviews and other testimonials that can work as what is considered “social proof” of the quality of your book. Multiple marketing studies show that people are more likely to trust the word of their peers than traditional marketing messaging. It tends to reduce the impression of bias, and is one of the major reasons books, movies, video games and other products use them in their marketing. This is one of the big reasons getting reader reviews on your product page (something we will address separately) is so high on the list of items writers strive to gain. Amazon, of course, does have a separate place in your book listing page to include “Editorial Reviews” and it’s something we will definitely want to leverage when building out our book listing, but there’s no reason not to include some of them here as well. Many people won’t scroll down far enough on the page to see the editorial reviews, and if they do they tend to be more likely to scroll past that information and go straight to the reader reviews. So including some of this information in the product description area will help to improve the strength of your overall sales pitch. Example of a formatted text in a product description. One particular aspect of the product description many people tend to forget is the actual formatting and layout of the text itself in regards to how it displays on the web page. We’ve covered this in small part in our discussion about “the break” but there is considerably more that can be done to optimize your listing for better conversions. What’s important to know from the start are the types of things you can and cannot do while formatting text. While not fully compatible with all HTML text formatting, you can do quite a few basic things, such as use bold, italics, CAPITALIZATION, formatted lists, special characters, and paragraph spacing to improve effectiveness. If you’re familiar with writing online, you likely already know this, but online copy works best when broken into small chunks. Paragraphs only a few sentences long. No big blocks of text. So line spacing and breaks between paragraphs are pretty important. They’ll make your description must easier to read quickly on a web page or mobile device. Along with this, you must assume that not all people will fully read what you’ve written. Meaning you have to make whatever you write easy to scan. Bold important words and make sure you clearly delineate different sections of the description so those who do scan can key in on the things you want them to notice. This is also where lists can come in handy, as they are easy to read and digest without requiring a customer to fully engage in reading your entire description. When optimizing for maximum sales, the areas described above (cover, title, and product description) are by far the most important sections you can optimize, though there are several others you can leverage as well. They will have lesser impact, but should not be ignored outright. And in some instances, may be more important than in others. The most important of these additional sections for most authors will be the Editorial Reviews section. With this area you can add any reviews you would like to, and usually excerpts from multiple publications or full reviews from editorial resources work best here. Just make sure that you have proper rights and permissions to use what you put here. If, for example, you purchase a professional Kirkus review, this is a great place to list that review. It can be particularly helpful in giving clout to your book – especially when you what you have is a fairly new publication and has little or no reader reviews. Or, you can take snippets (properly cited, of course) from any press or other reviews you might have received. Just be sure that whatever you put here, it’s easily formatted to be read. I do recommend staying away from reviews that are more like book reports or summaries than actual “reviews” though, as again you don’t want to give away too much of your story. If the review does contain a lot of overall summary, don’t copy and paste the whole thing, but instead be selective in what you include and refer to it as an “excerpt” from a larger review. Some people use this as an option to regurgitate the blurb as it appears on the back cover, but personally I have seen much better use of this for building out the branding of you as an author. Highlight snippets of what people have said about your previous works or writing (what readers are saying about YOUR NAME) or to highlight early feedback from your advance readers (early praise for BOOK TITLE). Again, this can have more value earlier in the launch phase of your book, when you don’t have actual reader reviews on the page to help build up reader trust. Reading can be a rather intimate connection between author and reader, and building up that connection ahead of time by giving your reader an idea of who you are as an author and person can aid in creating an early bond. Basic information about who you are, where you live, your education and interests all help here – especially if you’re writing specific to genres where some “credibility” may be needed. For example, I mention my degrees in Journalism and Philosophy in my author bios on my fiction writing, as my writing tends to have a philosophical bent to it. It aids the reader in understand what type of mind they will be entering when reading. Likewise, if you are writing nonfiction, putting credentials in here can be extremely important. For example, if you’re writing a cookbook and you’ve been a professional chef for twenty years, mentioning this in the author bio builds up credibility. This is also an excellent place to showcase any awards or other accolades you may have received. Again, building up credibility, particularly for those who are unfamiliar with you and your work. By far the most difficult to come by, but also of extreme importance in building customer trust, are reader reviews. Unfortunately, there’s no easy way to get them – and they take a lot of work. But having them on your product page can have a tremendous impact on the sell-through rate of your books. What’s most important here, however, isn’t the necessary the actual content of the reviews, but the quantity and overall rating. Again, many readers don’t actually scroll down and read the reviews – but they do see how many reviews a book has and what the average rating is. It’s listed right up there at the top of the page front and center. Right in the customer’s face. Unfortunately, getting reviews is fairly out of your control. It’s the one piece of vital information on the page that you really can’t do much about. You can, however, guide and encourage your readers to leave reviews. Simply adding a call-to-action request at the end of your books asking the reader to review can help considerably. As can reaching out directly to those who mention via social media, etc. that they enjoyed reading your book. Above all, do not be shy about asking for a review. Remind readers that a review doesn’t have to be a treatise. Even a sentence or two along with a star rating is enough to add the necessary data to help build clout as to the quality of your book. Again, many shoppers don’t read the actual reviews themselves. But they do notice how many reviews a product has and what the average rating is. The more reviews you have, the more it appears people are reading your book – and you can use this to capitalize on the “fear of missing out” phenomena where if readers see other readers are reading and enjoying a book, they want to read it too – and avoid “missing out” on something by not taking action. On a similar note, a mixture of reviews with different “star ratings” will generally help build out better conversions. People are a bit suspect by nature, and have been trained to believe that when something is too good to be true, it often is. Therefore, a book with nothing but 5-star ratings will in most instances convert to a sale at a lower rate than those with mixed reviews. A few one or two star reviews are not the end of the world, and build in more trust for potential buyers than nothing but perfect fives. In fact, some studies in online commerce have determined a rating of roughly 4.6 to be the optimal overall rating for converting a shopper to a buyer. Tip: Though you can’t really do much about reviews once they’re there, one thing you can do is vote on if a review is helpful or not. Amazon uses this information in ranking which reviews show up first when people do scroll down to read the reviews, and your votes can have an impact on which ones people will be presented with first. But… How Do I Edit All This Information? As you can see, there is quite a bit of information and data you can manipulate on your page to optimize for a stronger conversion ratio of browsers to buyers. And it’s not obvious where you can edit it all. Some of the data, such as your cover art or your basic description can be edited in the Kindle Direct Publishing portal. But where you really want to go is into Amazon’s Author Central. If you don’t already have an account, it’s free to set one up. And in here you can add all the books from your bibliography and then edit all the information like product description, editorial reviews, author bios and more. One additional thing to note is that Author Central updates data on a fairly quick basis. Though you’ll often see messages that your changes will be in place in a few days, you will likely see them live within an hour or less. This gives you a lot of opportunity to make adjustments and tweaks easily, just in case what you put together in their tools doesn’t quite match what you had in mind once it’s live on Amazon’s website. Tip: Link multiple formats of your books! All too often I will see authors who have paperback and Kindle editions of their books both available on Amazon, but no easy way to go from one format to the other. Amazon product pages directly support this, and the great thing about it is that this way you can drive your customers to whatever preferred version you want to send them to (Kindle. Paperback, Audio Book, etc.) and then the customer can easily switch to whichever format they prefer. Amazon claims to do this automatically, but I personally have not found this to be the case. Either way, you can easily expedite the process by submitting a request to Amazon support through Author Central, telling them the ISBNs and ASINs you’ll want linked, and they’ll do it in fairly short order. So now you know how to manipulate and optimize your book listing page. Great. Go ahead and do it. Chances are, however, that what you come up with the first time around isn’t going to be perfect. And that is totally okay. Your job now is to iterate on your changes. See what works, and what doesn’t. Keep switching things around until you start seeing positive results and then improve from there. Think of this as an ongoing experiment, one that has to not only learn from past tests but also to adjust to changing customer behaviors (and the inevitable changes Amazon will likely make to its pages over time). As your book matures, you’ll learn more about what parts of it people are tying into. What they enjoy, what they don’t. What triggers and emotional cues you can act on to make your sales page more impactful. Above all, don’t give up. This is a process. Just like your rough draft wasn’t perfect and took rounds and rounds of editing, so too will your book listings. But keep at it, and you’ll end up with a sales page that is equally as powerful as your prose. This article is adapted from my upcoming book, The Indie Author’s Guide to Independent Publishing, Marketing & Promotion. It’s available now for preorder on Kindle, and will feature information like this, as well as detailed breakdowns of creating Amazon and Facebook ads, how to build out and leverage your author’s “social presence,” and even tips on formatting, writing, and designing the best possible book – all without the aid of a traditional publisher. Pre-Order your copy of The Indie Author’s Guide to Independent Publishing, Marketing & Promotion now.